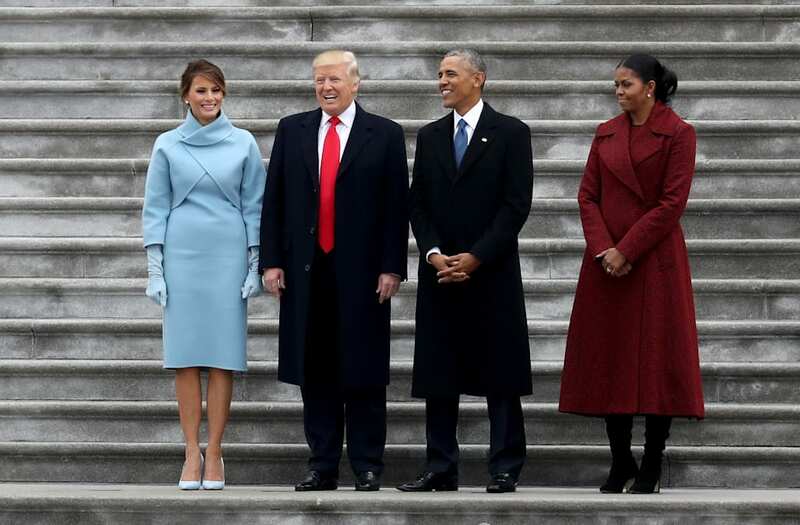 As new President Donald Trump and first lady Melania Trump made their entrance to his inauguration on Friday, people couldn't help but notice something seemed off about their dynamic. Images from the event make it look like the president left his wife behind as he entered the ceremony. The Obamas seem to welcome her with open arms, and later wowed crowds with public displays of affection. @yashar the Obamas treated Melania with dignity. It's a shame her husband did not. @yashar @karmickickback Poor Milania. She looks so miserable. @yashar @StephenARhodes Wow, just realized that it was Barack & Michelle Obama supporting her! @StephanieBaier @yashar it's sad to see any man treat his wife as an afterthought. Of course M knew the bargain, but it's still sad. Former first lady Michelle Obama came under fire for seemingly making a face as she accepted a gift from Melania Trump. Their exchange looked a bit awkward, but pleasant. Watch the video above to judge for yourself. WASHINGTON, DC - JANUARY 20: President-elect Donald Trump (2ndR),and his wife Melania Trump (2ndL), are greeted by President Barack Obama and his wife first lady Michelle Obama, upon arriving at the White House on January 20, 2017 in Washington, DC. Later in the morning President-elect Trump will be sworn in as the nation's 45th president during an inaugural ceremony at the U.S. Capitol.